Downtown Los Angeles is playing host to the Riot LA Comedy Fest this year. 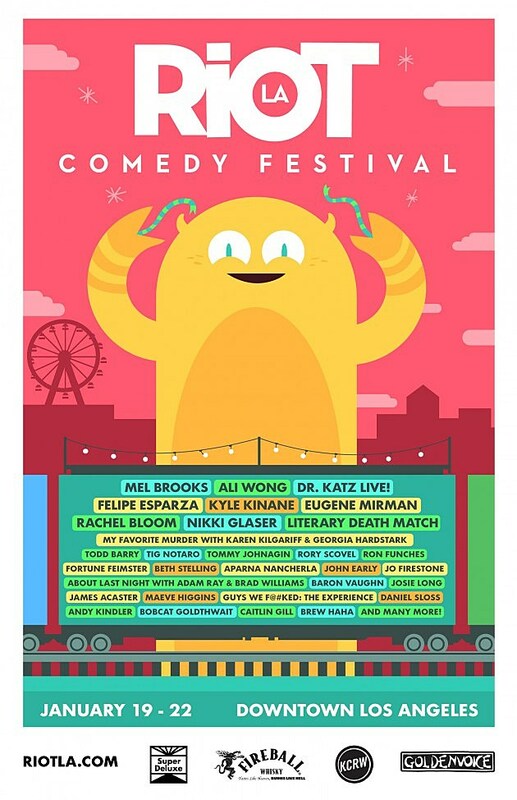 It goes down from January 19-22 at various venues in the city, and boasts a stacked lineup including Mel Brooks, Ali Wong, Eugene Mirman, Todd Barry, Ron Funches, Rachel Bloom, Kyle Kinane, Nikki Glaser, Tig Notaro, Andy Kindler, Bobcat Goldthwait, something called “Dr. Katz Live!” (color us excited), a live taping of popular podcast My Favorite Murder, and many more. Festival passes and individual ticketsgo on sale Friday, December 2 at 10 AM. The festival also includes a central area hangout known as The Lot (located behind the Orpheum Theater) and will feature videos and other content created by comedy site Super Deluxe, who’ve made a lineup announcement video for the fest. You can watch that, and check out the full lineup, below. MEL BROOKS * ALI WONG * DR. KATZ LIVE! * FELIPE ESPARZA * TIG NOTARO * EUGENE MIRMAN * RACHEL BLOOM * KYLE KINANE * NIKKI GLASER * LITERARY DEATH MATCH * MY FAVORITE MURDER WITH KAREN KILGARIFF & GEORGIA HARDSTARK * TODD BARRY * TOMMY JOHNAGIN * RORY SCOVEL * RON FUNCHES * FORTUNE FEIMSTER * BETH STELLING * APARNA NANCHERLA * JOHN EARLY * JO FIRESTONE * ABOUT LAST NIGHT WITH ADAM RAY & BRAD WILLIAMS * BARON VAUGHN * JOSIE LONG * JAMES ACASTER * GUYS WE’VE F@#KED: THE EXPERIENCE * DANIEL SLOSS * MAEVE HIGGINS * BOBCAT GOLDTHWAIT * ANDY KINDLER * CAITLIN GILL * AND MUCH MORE!